These tiny 36 cards were my gateway to psychic readings. I started reading with the Lenormand when I was 9. In Brazil they are well known as “Baralho Cigano” meaning “gypsy deck” and are very popular, even more so than the Tarot. This may be because the Tarot is still perceived by many as too complicated and esoteric. 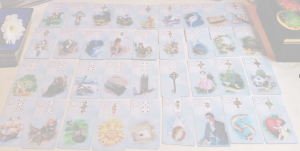 The Lenormand’s simplicity makes them unique. Their images really can bring a more instant rapport and for this reason this deck is seem as more direct. One is no better than the other though; it depends on how I connect with them. The Tarot can be just as direct as the Lenormand can be just as deep. I work with both and I think they complement each other really well. The Tarot nurtures my analytical, Jungian tendencies while the Lenormand brings my fortune teller side alive. The big difference I feel is that unlike the Tarot, this oracle was made to be predictive. Prediction is at the very core of Lenormand’s history. 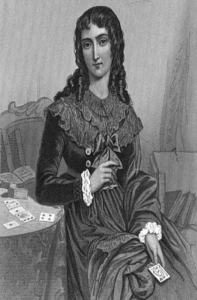 The deck is named Lenormand after Marie Anne Adelaide Lenormand, arguably the most famous psychic of all time. Known as the “sibyl of the salons”, she was a legend who lived a colourful life and counted no less than Napoleon and Josephine among her clients. Contrary to popular belief, Marie Anne did not create the Lenormand oracle; apparently she was given the deck by gypsies when she was 14 and they taught her how to read them. It didn’t escape me that fact that in Brazil they are called “gypsy deck” instead of Lenormand. Indeed, in Brazil the “gypsy” has always been seen as popular, “deck for the masses” in contrast with Tarot’s cult status. It is also much cheaper! I know some brilliant Lenormand readers there who have no idea of who Lenormand was! The French tried to colonize Brazil briefly in the 16th and 18th centuries particularly at a time of intense persecution and hostility towards gypsies in Europe so it is also possible that some were sent to Brazil along with the Portuguese and Spanish gypsies. Could there be a more meaningful reason why this deck is called Gypsy in Brazil? This is all fascinating material that of course will deserve further study. Lenormand published many books in her lifetime but no cards or divinatory systems of any kind. Only after her death her popularity inspired many decks that were refined by the times resulting in the popular Petit Lenormand containing only 36 cards that are commonly used today. It’s ironic that in my youth I didn’t really value my skills as a Lenormand reader. Little did I know how popular the Lenormand would become and the difference that would make in my work. There is not one client who doesn’t get curious about the images and mesmerized by the clarity and accuracy of this oracle. I also find that because the meanings are so clear, clients find it easier to connect with what is being shown. 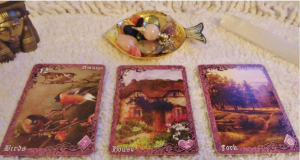 The Lenormand has inspired me to honour my roots as a fortune teller and proved that their simplicity is just as effective as the elaborate meanings of the Tarot. The Birds are tweeting near the house. I see discussions regarding home, family or domestic issues. The House next to the Crossroads indicates choices and even the possibility of moving. The lively birds can get excited and a bit anxious too. Perhaps they disagree in some aspects but sooner or later a decision will have to be made… Where will the path lead to? As you can see, the images are a delight to see and very easy to understand. Like the Tarot, you can use them in different ways and even do a spread with the full deck. My client Ruby might be dealing with a difficult or slightly dishonest man. His behaviour can be competitive or edgy because of the Fox. The Clouds show that situation is confusing and caution is needed. This could be happening at work as the Moon between them indicates a professional connection. The Crossroads bring a choice or an alternative as a new path unfolds for her during this turbulent time. Below her a stands a door, the Key is within grasp meaning that a solution is possible. Looking at the crossroads I see that the choice may be between professional stability and safety with the Anchor or renewal and change with the Stork, flying the nest towards new horizons. Ruby seems unsure. She may need more time to clear her mind before she makes a decision. Could an extra card reveal the way forward? The Scythe cuts ties so it’s possible that she will leave the situation behind. The decision may be sudden or something important will come up that will help her to reach her own conclusions. Please bear in mind that this is only one way of interpreting this spread. I can’t describe or reproduce here the non verbal exchange that happens during a reading that strongly influences how the cards are seen and read. This is only a sample but I hope you got a good idea of how the cards work. Literally we have all the cards on the table. How thrilling for a client to see this! 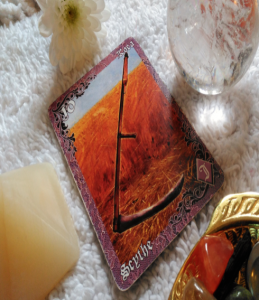 I start the reading by exploring the cards next to the client; they will reveal the current mood. Cards on the left side of the client relate to the past and the ones to the right reveal future trends. Needless to say, there’s enough information here in the sense that a reader doesn’t need to ask any questions regarding the client’s life and situation. 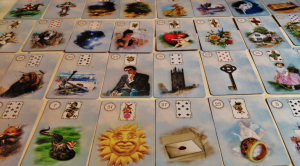 The Lenormand is a real gem that stands out every time and brings a lot of excitement and accuracy to the reading. If you are curious to see how your spread would be like, or to learn more about these lovely cards, get in touch! 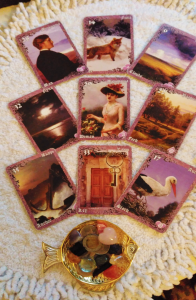 I offer readings and workshops with the Lenormand and I would be delighted to hear from you.